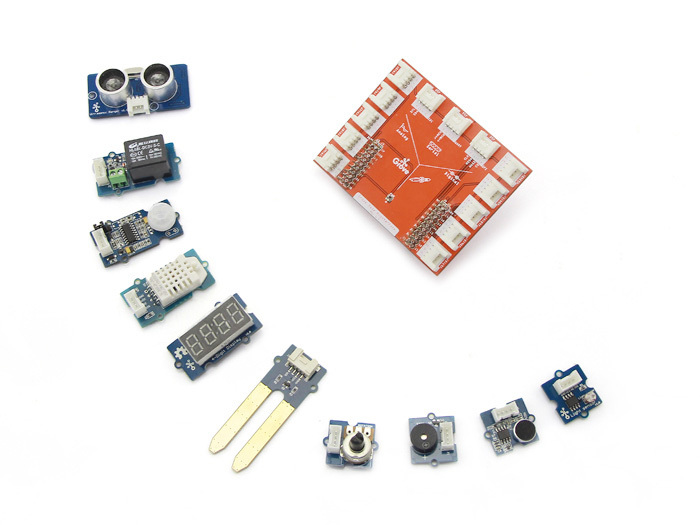 Grove Starter Kit for LaunchPad is a co-branded quick starter kit for Texas Instruments LaunchPad Development Kits. This kit carries one Grove Base BoosterPack and 10 carefully selected Groves modules. It enables users of the Texas Instruments Launchpad to rapidly prototype and hack together fun microcontroller-based projects. Grove Base BoosterPack is an expansion module that can plug on to the various LaunchPad development kits that TI offers. On the BoosterPack, there are 13 Grove connects, which feature a 4-pin standardized interface for enabling you to easily connect with Seeed's huge offering of Grove modules! Grove Starter Kit for LaunchPad makes it an enjoyable experience to dive into the world of electronics. The kit also includes 11 interesting examples that will guide you through on how to work with the TI LaunchPad, as well as 2 additional advanced demos that can inspire you for further project building. Decorate your room with tulips, and make your home a pleasant space. But what if I am too busy to take care of the lovely tulips? Now imagine your tulips will remind us when they are thirsty! We can set up a “conversation” with the help of Moisture Sensor, which can detect the electric resistance of the soil, and thus can show us the soil moisture by the 4-Digital-Display. When the moisture is below the value you have set, the buzzer will respond in a blast of sound of “DEE DEE”, reminding you of their need of water. At this moment, the Relay will initiate the motor to water your Tulips. When the soil turns dry and its moisture index is below the value you have set, the Buzzer will ring and the Relay will initiate the motor automatically until the moisture of soil reaches the parameter you set in the device. Have you ever had this idea? When someone gets closer or the night falls, the lamp of your room will turn on automatically. When someone leaves or the day dawns, it will turn off. Now we can work out the magic by Grove PIR sensor and Grove Relay. When someone gets closer, the Relay will interact with the “lamp” on LaunchPad for 10 seconds, and at the same time the light will be turned on. When it becomes darker, the device works in a similar way. Energia is an open-source and community-driven development environment for the TI LaunchPad development kits. It is based on the popular Wiring framework, which offers a collection of simple functions and APIs for programming a microcontroller easily. Energia support is available on many of TI’s LaunchPad development kits, featuring the MSP430, TM4C, C2000, CC3200 and other microcontroller devices.